Over six months ago I requested all flight plans, mission plans, reports and certifications regarding the Russian flights, and equipment used, over Canada. The Canadian Department of National Defence will send you a copy of what I received on a CD, if you request it. Once the file is closed (I'm still arguing a couple of points). You will be able to search for it here; look for document # A-2015-01490. The request is currently 392 pages (and 264.1Mb) of reports, mostly text, with some pictures and diagrams. You're a weirdo; why would you want all that? Well, Canada is a signatory to the Open Skies Treaty; as are the United States, United Kingdom, Italy, France, Belarus, Russia, etc... Every year the Royal Canadian Air Force flies observation missions, using wet film photography, and a CC-130 Hercules, over Russia, and potentially other signatory states. Really tho, it's mostly Russia. Russia reciprocates by flying their Tu-154M Lk-1 Open Skies aircraft over to Canada, and conducting observation flights of their own with RCAF representation on the flight. I wondered, since I'm Canadian, and feel our air-photographable military activity is rather boring, what could they possibly be taking pictures of? So, I filed an Access to information and Privacy request with DND requesting the documents that are are mandated by the treaty. 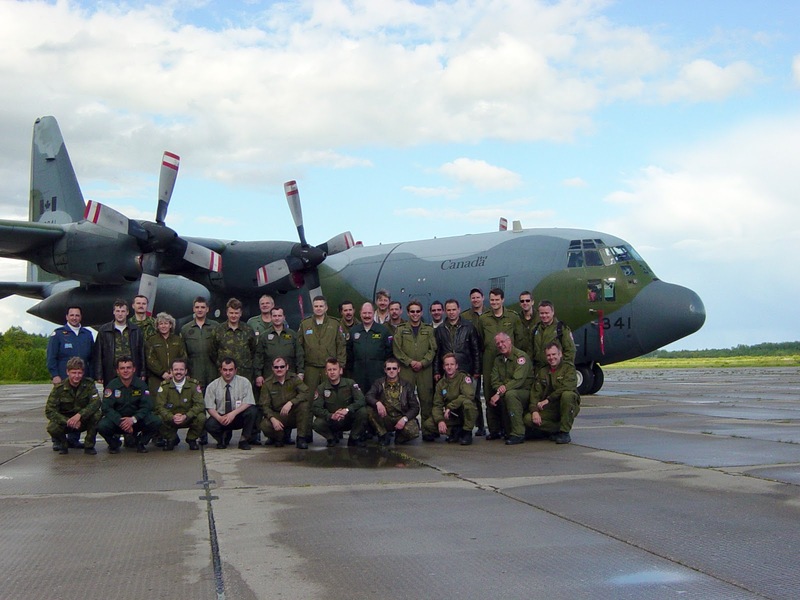 Until now, no details have been available about Russia's overflights Canada conducted under the treaty; the information was labelled "TREATY SENSITIVE INFORMATION", and some of the documentation was classified "NATO RESTRICTED" (NR). From this ATIP request, we know there have been ten Open Skies overflights performed by the Russian Federation over Canada between 2002 and 2014 (inclusive). There was an 11th overflight in December 2015, but that was outside of the scope of my request, since I made my request in November. When and where were these overflights, and what were they looking at? The following are the arrival dates, departure dates, official Open Skies flight reference numbers, and relative order of flights While the treaty was implemented in 2002, the Russians were unable to fly over Canada until they had a certified plane that could fly the extended distances over Canada (and the US) in 2004. I'm thrilled to see the Russians are photographing old Cold War Pinetree Line sites; we have some common interests! If you think aerial photography of a decommissioned Cold War site is a pretty ridiculous idea, think of it this way; from a Russian military point of view, why wouldn't we re-use those places for new bases? They are already levelled, most still have access to rail and highways, they have power nearby, telecom, etc.. From my Russian research I can tell you many of their old Soviet-era military bases have been re-purposed and are still military bases - I speculate they figure we'd do the same. The Russians also overflew Suffield, Alberta, where the Defence Research and Development Canada Suffield Research Centre is located and the Canadian National Single Small-Scale Facility (SSSF) is located; where Canada keeps it's small amount of Schedule 1 Chemical weapons, that are allowed under the Chemical Weapons Convention (CWC), for research purposes. Examples of Schedule 1 Chemical weapons are: VX, Sarin, Ricin, Mustard gas... I can't find record of having Bio-safety Level 4 (BSL 4) pathogens stored there, but Bio-safety Level 3 (BSL 3) pathogens are. They checked up on all of our Canadian Forces Ammunition Depots, coast to coast. I would think that was fairly predictable, since activity at those sites would indicate we were getting ready to move weapons somewhere. Also, good pictures of those facilities might provide clues as to what kinds of ammunition we are storing at some of those sites. Between Masset, Leitrim, Gander, and Alert I only see overflights and pictures of Leitrim; maybe with additional analysis of their flight plans I can determine if Masset and/or Gander were also photographed. They did not fly all the way to Alert, nor do I expect they will, since it would take a long time to get there, and they might overshoot their treaty defined maximum distance. Plus, like Sarah Palin can see Russia from her house, the Russians can "see" Alert from their side of the Arctic. Some Republicans in the United States Congress, factions within the US State Department, and some senior members of the US Military want the American people, and NATO allies, to believe that the Russian Open Skies Treaty overflights are being abused by the Russians, used as an intelligence gathering apparatus, spying on civilian infrastructure without any military merit. These forces in the government and military ultimately want the program shut down. To those who would believe them, I say - Well of course they're gathering intelligence; that's the whole purpose. Intelligence on whether industrial areas are being militarized would signal an uptick in military hardware production. Intelligence on rail and road networks to see if they are being used to transport large amounts of military gear. Intelligence on uranium mining and processing facilities, to see if production might signal the fabrication elsewhere of nuclear weapons. Intelligence on Canadian military ammunition depots, bases, and all sorts of military facilities would show a direct correlation to preparations for deployments. These are the things that are shown to be getting photographed; we should expect it, and welcome it, because we do the same thing over Russia. Let's take the railway as an example of civilian Infrastructure they are likely observing and taking pictures of. Canadian rail is privately (civilian) owned, and stretches coast to coast. It is used for everything; wheat from the prairies, bulk chemicals, oil from Alberta, cars from Southern Ontario, Aluminium from Quebec, freight from everywhere.... oh, and heavy military equipment. While the Canadian rail system could be called civilian infrastructure, it certainly isn't something they'd want to skip when photographing Canada - that's how he armies of the world usually ship their gear! Is this an example of the "infrastructure" the Americans promoting the new Red Scare want you to be afraid of the Russians photographing? If you study history at all you'll notice almost anything civilian becomes a military asset during a war, or during the preparations for war. Monitoring "infrastructure" is very much in-line with the spirit of the treaty, if you consider what preparing for war would look like. Civilian factories can start pumping out green trucks and weapons. Vehicles being moved around by rail could be getting deployed to harbours for trans-Atlantic or trans-Pacific deployments. Green trucks parked in parking lots could be waiting for supplies. Air bases could be preparing planes for operations... anything goes. Furthermore; how would you know if something was or wasn't out of the ordinary? You'd need a baseline; pictures "before" suspected preparations started, to compare with. Nowhere in almost 400 pages of reports and flight plans did I see any mention by the Canadian Forces Arms Control Verification team that any of these flights by the Russians were out of character for an Open Skies overflight. Maybe they missed that detail? I think that would be unlikely. The mission reports are extremely detailed; including the mention of walking tours in Ottawa on the Russians' day off, a tour of Kingston on a rain-day at Trenton, and how they very much appreciated the accommodations and food they were provided during their stay. While the American military would like us to believe these are the Boogeymen, and increase defence spending for this grave threat, I see no indication of any suspicion or apprehension in any of these reports, written by the Canadian Forces, and distributed to our NATO partners, which would back that narrative up. Use commercial satellite imagery, they said. It's good enough, they said. The American military would like the people of the world to believe that commercial satellite imagery would be good enough for the signatory nations who are part of the Open Skies Treaty to rely upon, and use it for national security verification purposes. Doing so would raise a major problem that strangely hasn't come up in the Congressional meetings so frequently quoted in the American media; tampering. The Open Skies Treaty defines a framework of tamper-proof cameras and procedures for handling wet film that ensure no tampering by any nation can take place; a representative of the overflown country is even present while the wet film is processed. The same cannot be done with commercial satellite imagery. Considering the budget of world's intelligence agencies, not just the American ones, it is inconceivable that they would be unable to tamper with the digital imagery before, or after, they are downloaded to a satellite ground terminal. You can also be assured that the American National Reconnaissance Office, who have spent untold Billions on spy satellites, will not be using that commercial imagery for anything at all. What isn't spoken of very much is we do the exact same thing back at them; The United States, Canada, and other Western-aligned nations routinely fly over Russia and take pictures of the same types of facilities as they do to us. Don't we all have the same objectives, and aren't we looking for the same things? The Open Skies Treaty is as relevant today as when Ike proposed it originally, and former Republican President George HW Bush revived in 1989. I propose that factions of the US Government and US Military are deliberately trying to mislead the American people, and those of the world, into believing the treaty is no longer of any use. I don't believe their arguments hold up under scrutiny, but I have yet to see anyone ask questions which are critical of the positions of the Admirals and Generals who are trying to destroy the treaty. Why is that?